The chart illustrates the probability of spreadsheet risks (e.g. errors, non-compliance, etc.) existing within the organization. If any of these spreadsheets support a critical internal process and go undetected, they could cause harm and have adverse impact to the financial performance, integrity or reputation of your organization. Typical risk management and audit programmes do not have the capacity to truly scrutinize and appreciate the detail of spreadsheet models, controls and risk. Other technology solutions lack the extensive data analytics capabilities and require end-users to modify their approach. 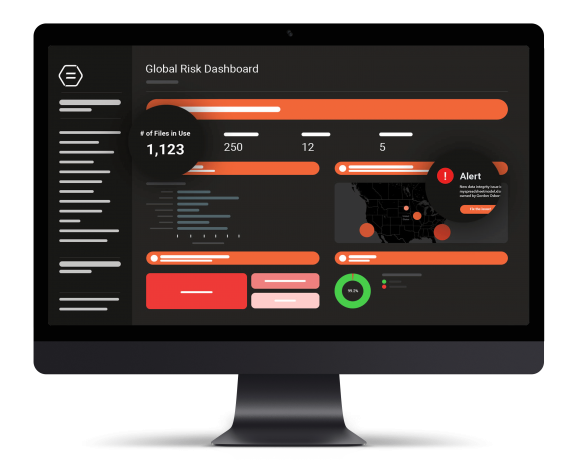 HUB85 has created the only all-in-one solution that provides full transparency for decision makers and end-users, therefore minimizing the potential for adverse impact to your organization. Spreadsheet Business Intelligence™ provides a rich, holistic view of your organization by centralizing and cataloguing an inventory of spreadsheets and then enriching it with the results of our proprietary analysis. Having a single, broad perspective for how your organization is working on the ground is the starting point for governance, control and change management. You will automatically get alerted to new risks which come accompanied with the details you need to confidently take action and efficiently resolve. All of this information remains securely on-site, or in the cloud, and is delivered in flexible and relevant reporting. Execute your governance strategy. Back it up with metrics. Without requiring any modification to end-user behavior, you will get an organized, picture perfect view of the spreadsheet environment. Quickly understand the scale, scope and context of spreadsheet use across your entire organization. Identify and address enterprise risks before they become material. Our technology automatically keeps track and analyses each spreadsheet to identify where risks exist within your organization. Intelligent alerts automatically direct end-users to address mission critical issues with precision and certainty, saving the organization time and money. 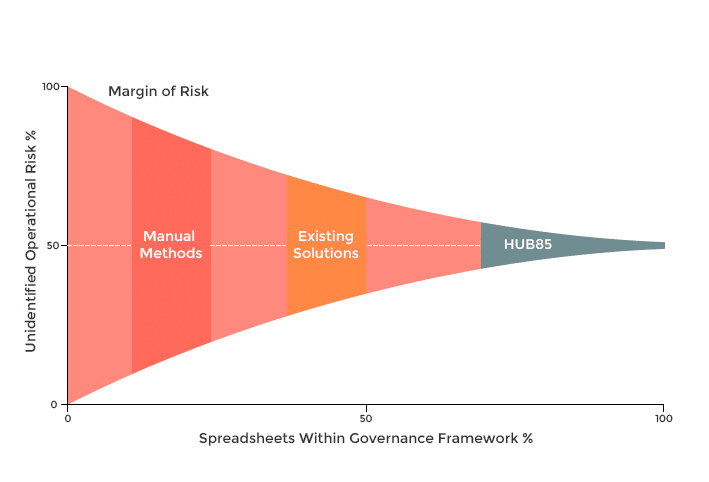 Whether you want to reduce the volume of spreadsheets, migrate processes into new technologies, or want to employ best-practice, governance and controls around the use of spreadsheets, HUB85 gives you everything you need to improve business operations and run efficient change management programs. This solution is packed with features that can help protect, enhance and deliver value to spreadsheet dependent operations. Book a demo to see our solution and get a full product walk-through.